"Prentice Hall Literature: The British Tradition weighs in at around six pounds and may not be the most mobile of books to carry around with you, but there's no denying the collection of literature contained within. This book contains some of the best translations of Old English you may find, making for a much more accessible and natural read for the reader. With works spanning British literature, Prentice Hall Literature: The British Tradition is a fantastic collection of works intended to give the reader a sense of the grandeur and scale of British history. The British Tradition is recommended for any student of literature who wants to understand where English literature begins and how it evolves." 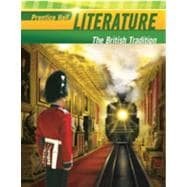 The British Tradition: Prentice Hall Literature 2010 Student Edition Grade 12: 3 out of 5 stars based on 1 user reviews.